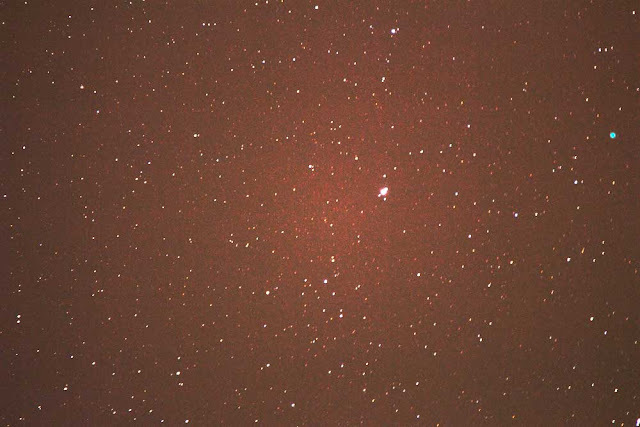 quite dim and not necessarily naked eye visible, the amateur needs a good tracking goto mount that can point accurately at the selected target. It's so nice just to be able to tell the mount to go to some target and have the target be right there centered in the camera field of view. Now, some of you have already achieved this goal, but I've been struggling to get it right for some time now. A lot you have provided valuable guidance and if I had been a little more diligent and read the manual for my AVS mount, I could have achieved this much earlier. But, since I normally just skim the manual and only go back to it after all else fails, I didn't get it all figured out until I got this self-aligning mount. Anyway, so I'm finally able to probably get accurate alignments with both mounts now and the goto capability brings the target right in center view. See, my path to becoming a more proficient amateur is fraught with perils, many of my own making, but with time and patience. progress can be made. The photos this week were taken in between bouts of marine layer moving in and the one night that turned out to be quite clear, Resident Astronomer Peggy and I had a teenage house guest. Now I thought that we were too old to have a puppy, but Astronomer Assistant Ruby, showed that we can still handle that (barely), and when Recent Graduate, Aspiring Musician and Still a Teenager, Kody, spent the weekend, well, we just learned to deal with it and actually had a lot of fun. Anyway, Kody was excited about looking through the telescope (in this case just the 600 mm telephoto lens on my camera). He was so excited and just beamed with excitement when he experienced seeing stars that were thousands of light years distant and yet the light from them in the past is just reaching our eyeballs now. Pretty neat, I had not experienced that feeling for some time now. Thank you, Kody. 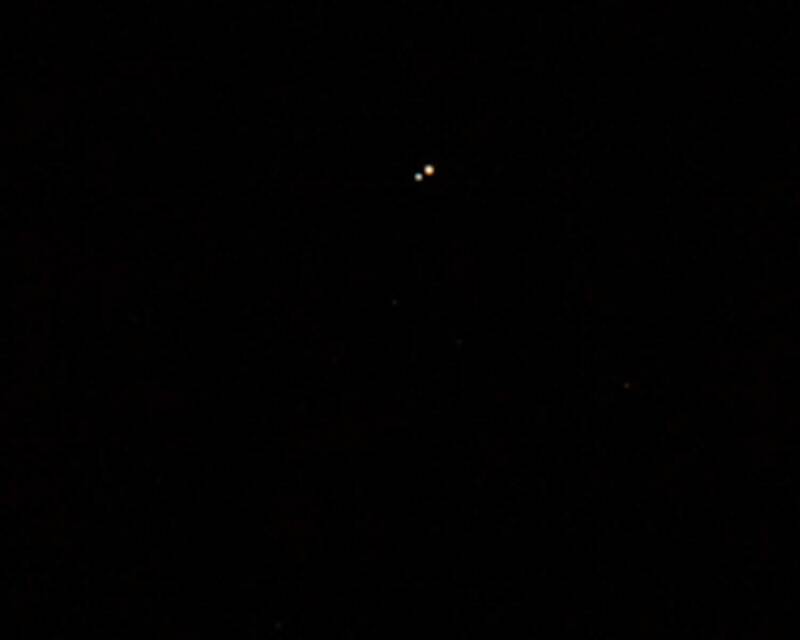 The first attached photo is the double star Alberio. 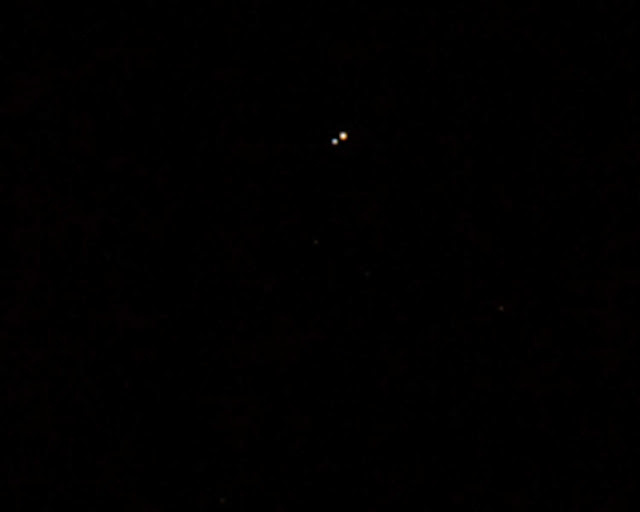 I like doing Albireo a little out of focus so that the gold and blue colors come out a bit more. 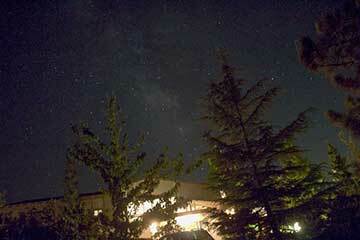 Next, I slewed the camera to Sheliak, or Beta Lyrae, as it is also known. This is my eclipsing binary star target. 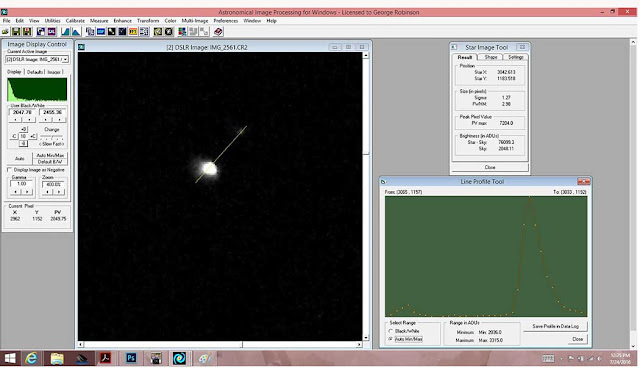 It has a period of 12.9 days and is visible at magnitude 3-4, but not naked eye visible for me here a the observatory. So, I took an image and later on sent it to astrometry.net, which is a public service that will examine the background star field and identify the actual position on the sky. See the attached feedback page, which shows Sheliak, mostly at camera frame center, and fortuitously M57, The ring Nebula, is conveniently located in the same frame. 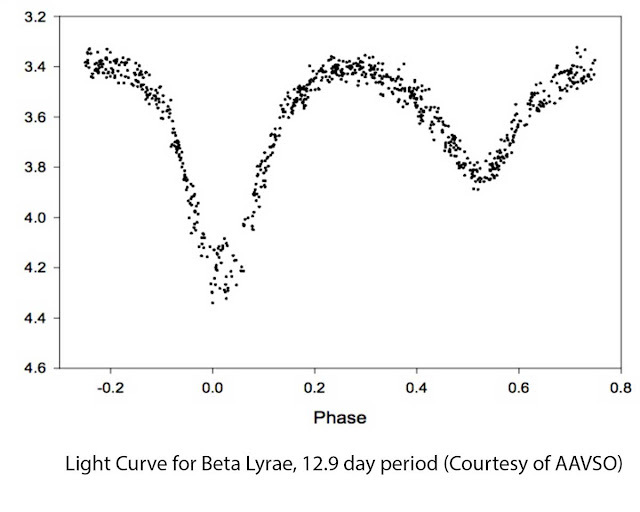 Now the target eclipsing binary star, Sheliak, is the brightest star in the frame and my goal is to take images over the 12.9 day period and see if I can't get the same type of light curve data observed by other amateurs. I'm a member of the American Association of Variable Star Observers (AAVSO) and they have many years and databases of light curves available for review. 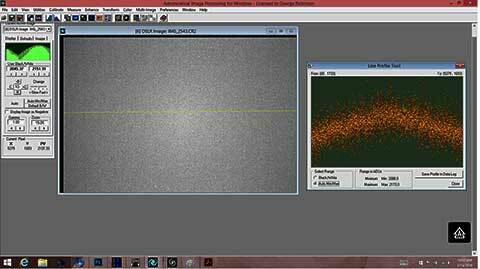 The next attached photo shows what the light curve for Sheliak looks like. Notice that the magnitude changes from about 3.4 to 4.4 over the 12.9 day period and that when the dimmer star of the pair eclipses the brighter one, you see quite a dip and when the brighter one eclipses the dimmer one, you see a smaller dip. Pretty neat stuff, which I hope to duplicate on my own as I learn how to do all of the processing to collect light curve data. Oh, yeah, I guess I better show the 120 second exposure of Sheliak with M57 in the corner. See attached photo. Just using a 600 mm lens the Ring Nebula is just a little blue smudge, but still pretty neat. Now that the scope is going to and following the selected targets, I can try using the higher power Barlow lens to get even larger images, when the marine layer permits. Finally, for all you budding astrometry students, you know that in order to measure light curves accurately, there are several corrections that have to be made to the stellar images. You have to correct for the air mass, which is the amount of atmosphere the light from the target star goes through, which is a cosine function of the elevation angle for the observation. I didn't correct for this at this time but I did gather data for the other necessary correction which is the normal camera lens vignetting, which causes the center of a uniformly illuminated space to appear brighter in the center of the image than at the edges. Check out the final image taken with the 600 mm lens pointed at the uniformly illuminated twilight sky. You can pretty much see the image is brighter in the image, but with the help of AIP4WIN analysis tools, you can see the camera/lens gain profile for this image. This profile and the whole image actually is called a "flat image" and is used in further processing to compensate for the vignette effects that would result in an error in measuring variable stellar magnitudes unless the star were at the same location in all subsequent data frames. Boy, trying to do sciencey type stuff takes a lot of work and a lot of corrections to get useful data. This data is often very useful for professional astronomers too. In fact, I just got an email from AAVSO that passed on a request from real professional astronomers to capture data from a variable star that is apparently going through some serious type conniptions right now and the big guys are asking for amateurs to get the data. 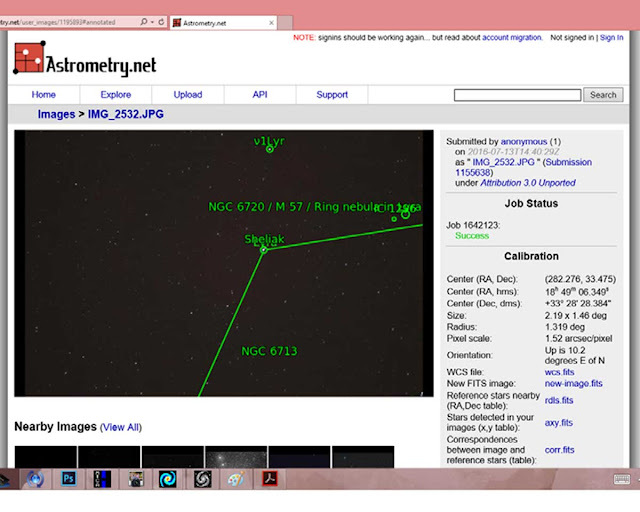 That is pretty neat, but when I looked at the details of the request, the star is of magnitude 14, which is just slightly brighter than Pluto at magnitude 15, so, no, that is way beyond my capabilities. I think you would need something like a 10-12 inch scope to be able to see that or very good tracking with longer exposures on a smaller scope. Well, that is about it for this week because the marine layer keeps coming back. In the meantime, Resident Astronomer Peggy and I have signed up for a tour of the Big Bear Solar Observatory. That should be pretty neat and it will be good to get up to the mountains anyway. If you haven't seen the BBSO, they offer free tours, you just have to drive up to Big Bear.